As there is no perfectly conformed alpaca, there is an amazing variation in the quality and type of fleece alpacas produce from animal to animal. Conformation problems are easier to see than fleece variances, although fleece characteristics are easier to breed for and improve quickly with careful selection of sire to dam. Since fleece is the primary end product of the alpaca, you should learn to evaluate fleece. 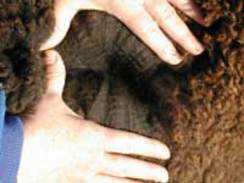 To the untrained hand and eye, the differences of the various fleece characteristics are small. To the trained, this is the primary criteria that separates an $8,000 female from a $35,000 female. Internationally, fleece makes up 60% of the judging at shows. 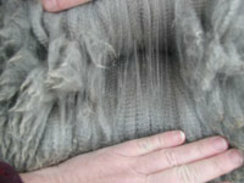 Here in the U.S. fleece is split 50/50 with conformation. This is usually separated between the total weight and the "blanket" weight. The "blanket" is the better quality weight and would go from inside the neck to legs and backbone to sides. (Neck, legs are next in quality and the belly make up the remainder of fleece). Density and staple length determine total shearing weight.Density: Determined by the ratio of primary to secondary hair follicles per area of the skin. In huacayas you judge this by:1) looking2) pressing down on the alpaca's back or into the sides (Does it feel dense? Does it spring back? Can you see the skin when the fiber is parted? Does it fill up your hand or is there no "body" or density? This test is not 100% accurate as finer fleece (which could have more density) could feel less dense than coarser fiber. The same is true for pressing down. Coarse fiber will give more resistance. Be careful to take fineness into consideration. ); and 3) part the fleece with the heels of your two hands. If you cannot see the skin, it has a higher probability of being dense. If you can barely see the skin, it may be fairly dense. If the skin is readily apparent, it may or may not be dense. Some very very fine fleeces with a high number of follicles per square millimeter may seem less dense because they may form bundles which will almost seem to lay down across and down the body of the huacaya, giving the initial impression of a lack of density. Upon grabbing this type of fleece your hand will be very full and you'll be able to actually feel the weight of the fiber. While staple length is important, you must also know the shearing date to calculate the growth properly. 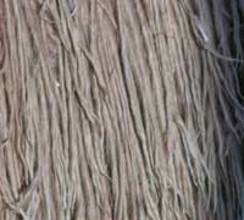 The blanket is generally less coarse and the fiber has less medullation. The less medullation and coarseness the head, neck, legs, and tail have the more consistent the fiber. Fine, consistent fiber blanket is what you should be breeding for. The color chart has 22 natural colors. Different colors are in vogue at different times. Chilean and Bolivian animals were the first to arrive in this country. Chile has all colors of alpacas. Peru has the largest numbers of alpacas in the world. They began coming into this country in 1993. Peruvians had selectively bred color out of their alpacas as the commercial mills in Peru paid a premium for white fiber. They could dye the fleece any color. Many say that Peru has better quality fiber producing alpacas. This could be stated because as a generalization Peruvian animals came from the larger cooperatives and larger wealthier breeders than simply the peasant Indians with a few alpacas and open field breeding. This could be stated as there are more alpacas in Peru than any place in the world. Logic would then say there must be more of the higher quality fiber producers. Focus on the quality of your alpaca's fiber, not on the country of origin. Generally, white and lighter colored alpacas have finer, better fleece, but individuals may differ. Generally, it is harder to obtain finer, better quality fleece in blacks and greys. However, individuals differ. Pick the breed and color you want to breed for and work within that framework. Softness and "good handle" is how you can tell finer fleece. Generally, the finer the fleece, the softer the feel and the higher price for the fleece. Should you send your fleece in for a histogram to a testing laboratory? Some people do, some people don't. Part are from not knowing or caring, others won't as they feel they are unreliable or misleading. However, relying only on micron counts can be misleading. In fact, some people will not do a micron test on their animals because of external factors. You should only use micron counts as one of many tools for evaluating an alpaca's quality. Generally, the younger an alpaca, the lower its micron count. As alpacas age, their micron count typically increases annually (If you find a female at 7 or 8 with a micron of 20 or less, she has a good probability of being an excellent producer - all other things being equal). Diet can affect microns, especially higher amounts of protein. Seasons of the year can affect micron. Pregnancy, especially late pregnancy and nursing her cria can make for higher micron counts. Location where the fiber sample was taken from the alpaca can affect micron count. Many factors can affect micron count. So take your tests, then touch and feel your alpacas. Compare the two to help you be a better judge of the fiber of alpacas (better yet, go to some fiber seminars). Referred to as brightness in huacaya, luster in suri fleece, this is the amount of light that a fleece reflects, it's "shiny-ness". A suri without luster should not be reproduced as luster is one of the most important keys to determining the quality of suri fleece. A huacaya with a great deal of brightness is also desirable. Care must be taken however in evaluating brightness in huacaya as coarse guard hair can look very bright to the eye but will be coarse to the hand. 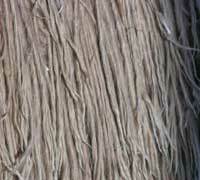 This is the other key determinate in suri fleece quality. Small, uniform and highly defined locks are more desirable. Look for this uniformly from the tail to the head. Huacaya lock structure tends to have "more character" or definition the denser the fleece. While luster and lock structure are positives for suri fleece, crimp is a fault. In huacaya's, crimp is a desirable quality. Generally, crimpier fiber with high amplitude crimp is finer and denser. Spinners say it is easier to spin. If crimp is uniform throughout the body, judges score the alpaca higher. They will look at number of crimps per inch, amplitude, which is the height of the crimpy wave. It can have great character or be a fine crimp as long as it is consistent and tight throughout. This is how the fleece feels. The more uniform the feel, the less the variation to the touch, a trait most handspinners appreciate and value. For each CV under 24, the micron can be adjusted down ¼ of a point for an "adjusted spinning fineness".